Of the 44,011 ballots cast, 43,922 voted for former president Mohamed Nasheed and 14 voted against. 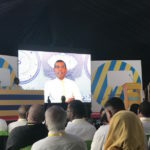 More than 40,000 members of the main opposition Maldivian Democratic Party voted Wednesday for exiled former ruler Mohamed Nasheed to be their candidate in this year’s presidential elections. 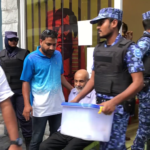 Voting continued until midnight despite police snatching ballot boxes to execute a court warrant, which came after the Elections Commission declared the referendum unlawful over Nasheed’s ineligibility to run for office with a 13-year prison sentence. 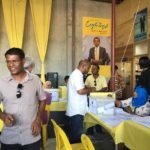 Of the 44,011 ballots cast, 43,922 voted for Nasheed and 14 voted against, the MDP announced early Thursday. Some 75 votes were deemed invalid. More than 50,000 members were eligible to vote. If a single candidate runs unopposed, the party’s rules dictate that he must secure at least 10 percent of the vote. 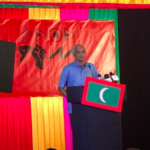 Despite police disruption, voting continued in polling stations across the country and overseas after the MDP disputed the validity of the court order due to the misspelling of the party’s name as the Maldives Democratic Party. It also accused police of contravening the criminal procedures code as the civil court order did not authorise entering or confiscating private property. “Despite this, police violated the rights of thousands of Maldivians in a coordinated, national effort by physically obstructing today’s primary and arresting several MDP members,” the party said. Some 20 members were arrested from Malé, Addu City, Haa Alif Ihavandhoo, Haa Dhaal Makunudhoo, Kulhudhuffushi, Vaikaradhoo, Raa Dhuvafaru, and Dhaal Kudahuvadhoo. Videos posted online throughout the day showed supporters clash with policemen in MDP strongholds. 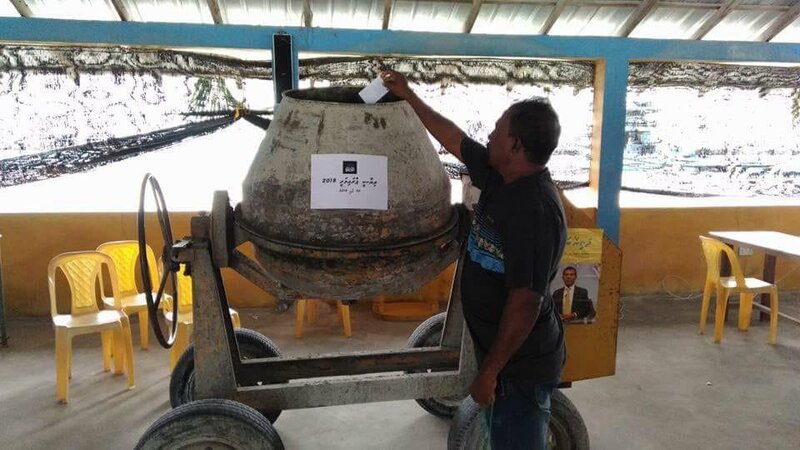 On the southern island of Kolamaafushi, officials went door to door to collect votes in a plastic crate as policemen were forced off Raa Maakurath. 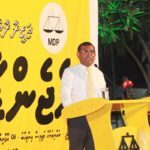 “It is inspiring to see that Maldivians are rising up with the belief that democracy must prevail, despite the atmosphere of military rule and repression imposed by President Yameen,” said Nasheed. Earlier on Wednesday, the broadcasting regulator and police ordered Raajje TV to stop its live coverage of the primary voting. Media outlets were previously warned against “promoting” convicted opposition leaders. 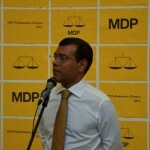 The EC threatened to dissolve the MDP if the primary was conducted with Nasheed as the sole candidate. The first round of the presidential election is due to be held in September. Warmest congratulations to @MDPSecretariat members for the exemplary dedication and perseverance demonstrated today in ensuring the right to vote and for the enthusiastic turnout across the country despite politically motivated obstruction & harassment by Govt.